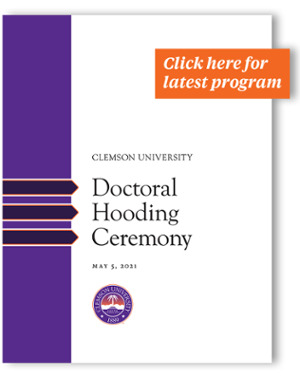 The May 2019 Doctoral Hooding Ceremony is scheduled for Thursday, May 9th at 7:00 p.m., at the Brooks Center for the Performing Arts. Graduating PhD students who want to participate in the hooding ceremony must register by April 15, 2019. If you wish to register after that date, email jillbb@clemson.edu to determine if it's still possible.